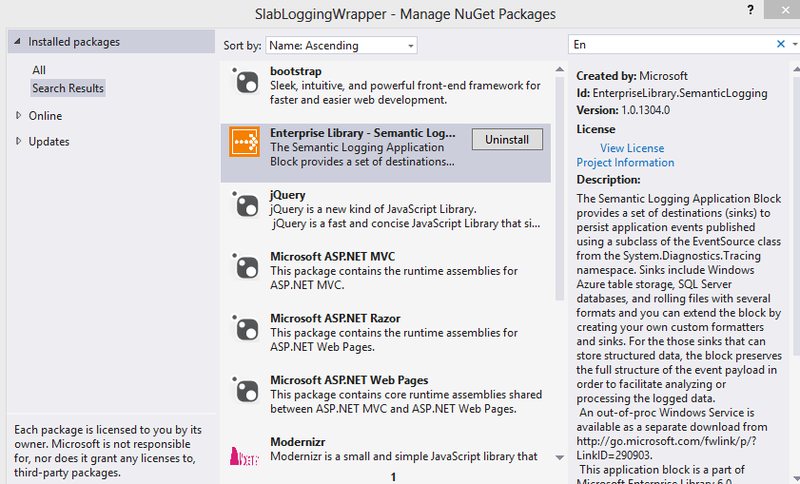 Slab Logging or Semantic Logging is part of the Microsoft Enterprise Library 6. In this post, a wrapper framework will be used to log and use EventSource classes. The EventSource can then be used with an IoC container without requiring static constructors. We don’t want to create a wrapper class for each EventSource. Static methods will be avoided. The logging assembly is not coupling to the other assemblies and can be replaced easily if required. Automatic testing is also less complicated. The application is a simple MVC 5 application. 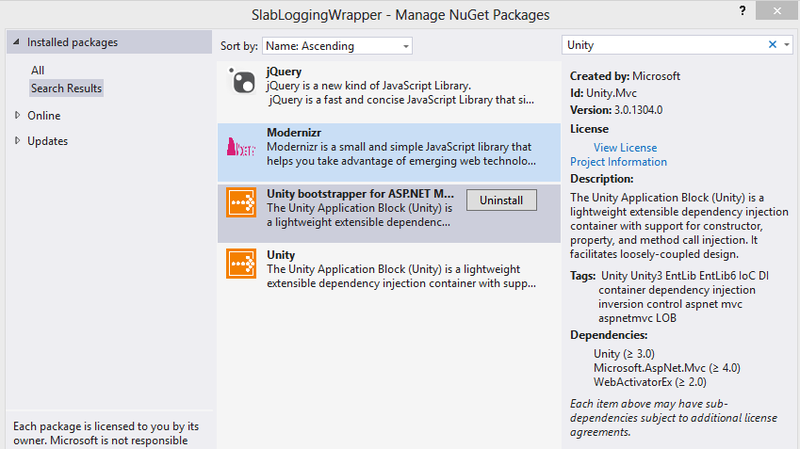 Unity bootstrapper is added for the dependency injection. We also add the Semantic Logging. Now we can create a new class library which will be used to define our log EventSources. We want a simple interface. As we need to define a unique EventId for each Event, will will also use this to set the log. Then we pass the message. A wrapper class is required for each event source because the EventSource classes must be a singleton within an application. This class uses application unique EventIds and has a special method RegisterLogger. This method adds Actions to a Dictionary using the EventIds as the key. This is then used in the implementation of the Logger interface. We can define n-Logger implementations or if needed n-Logger interfaces with different implementations. These classes can then register any EventSources required in the RegisterLog method. The Log method justs gets the action from the Dictionary and invokes it. To use the logger, it is registered with unity. In the Log method the const ints are used and not raw ints. // Every const has a unique id. This logger is simple to use in any injection container. If a Logger was required in an attribute, property injection could be used. The application uses SLAB OUT-OF-PROCESS Logging, that’s why only the EventSource classes and the Logs are required.